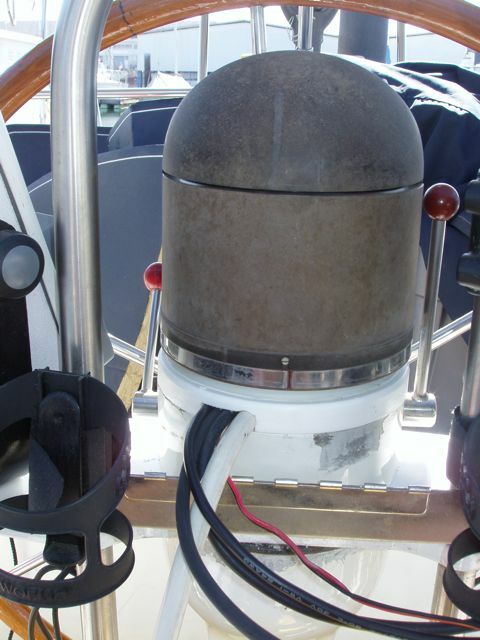 All the instruments are installed and are working, including our new sonar/speedometer/thermometer. 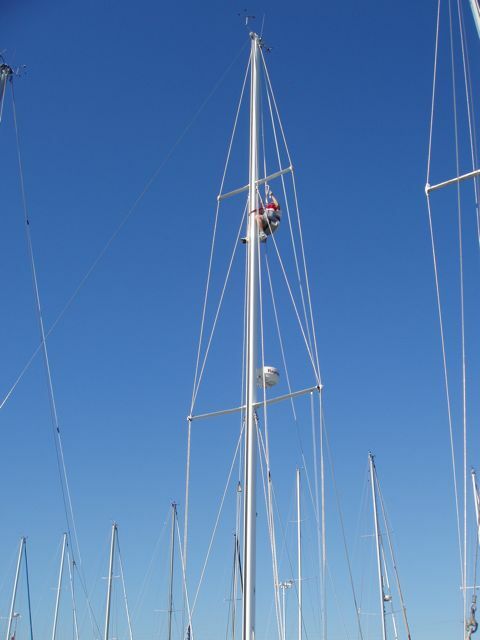 All of the halyards are lead. The main is on, as is the lazy bag. We're much closer than before and a host of the larger tasks have been completed. 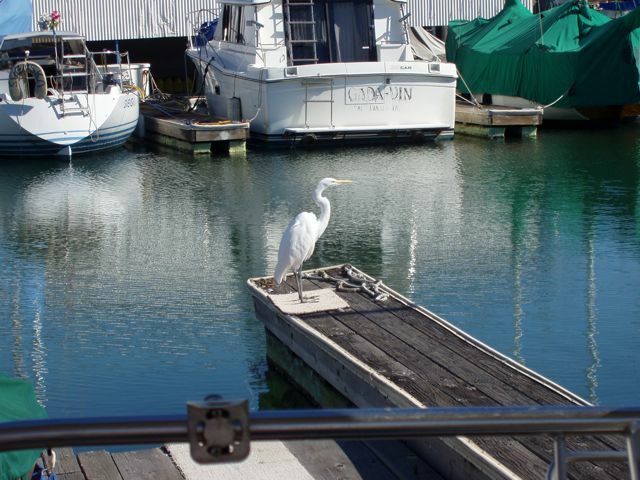 One of the many Fortman Marina Egrets. The binnacle prior to the "donut" installation. Getting all these cables up a binnacle not designed to hold them has been a major challenge. 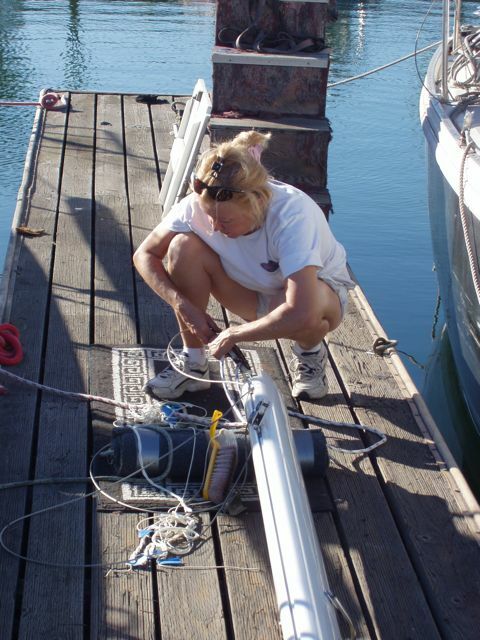 Conni's constant work on the boom resulted in our installing it on Wednesday. Conni the Rigger! 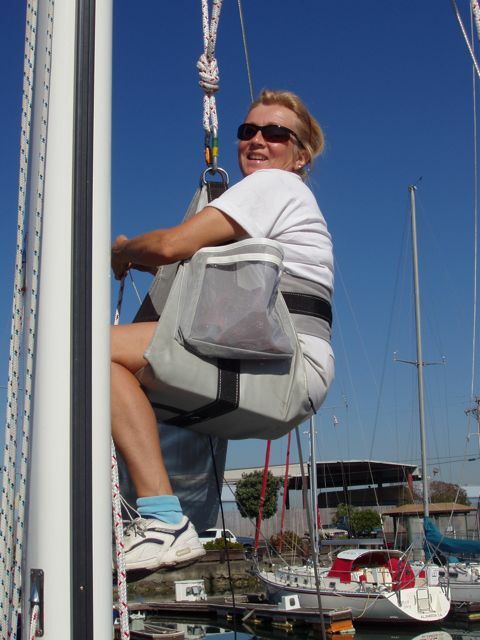 She's working on the main halyard while hanging from the jib halyard. What a woman! Although I designed the white donut, LaVerne Livsey installed it, and what a job he did! It's a professional job. 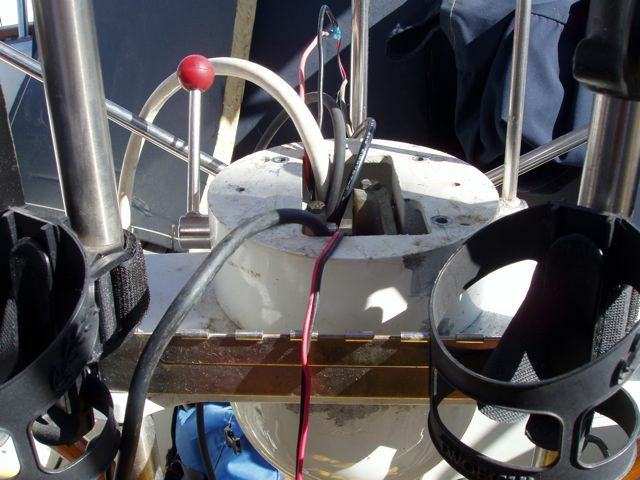 Another image of the donut, showing all of the cables leading to instruments. The instrument cluster that is fed by the cables radiating from the binnacle. The white front at left is the Probe forwarding-looking sonar. 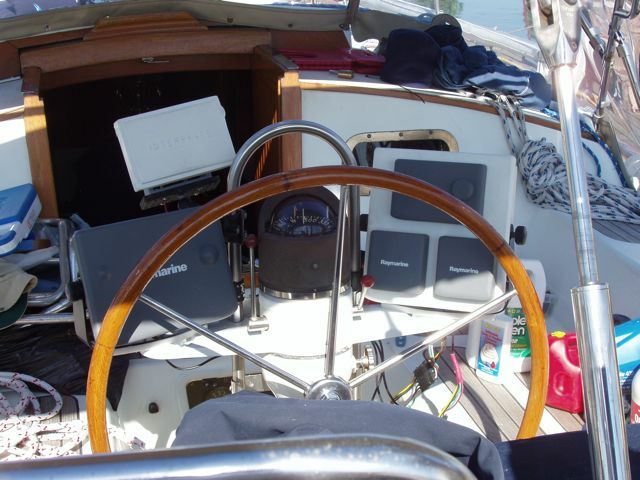 The large gray front below it is the Raymarine C80 chart plotter and display for radar and sonar. The small cluster at right houses the autopilot (top), the wind display (lower right), and the graphic display (lower left) that can display any data on the network. The deck in disrepair, prior to the instalation of the boom that's lying on the starboard side deck. 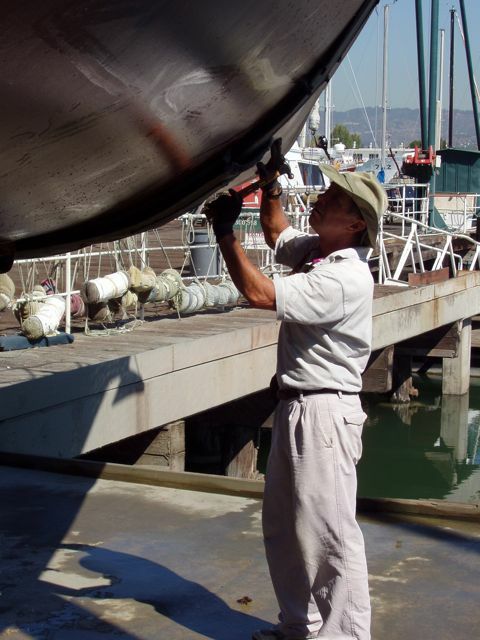 Bill Melbostad, our surveyor, taps on the hull to find delamination damage. 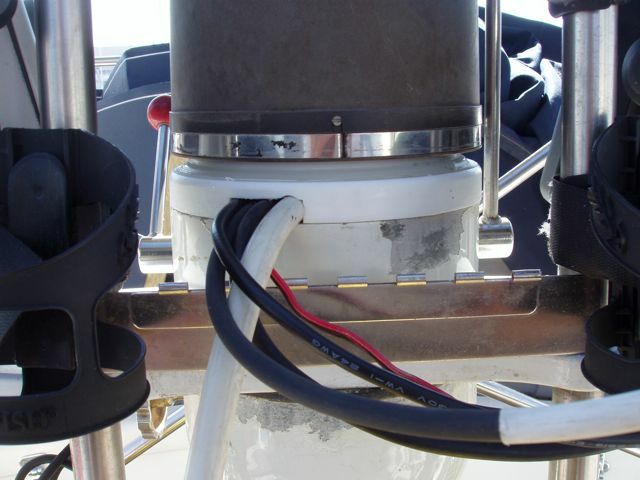 A sharp "crack" means that the hull is solid and undamaged. 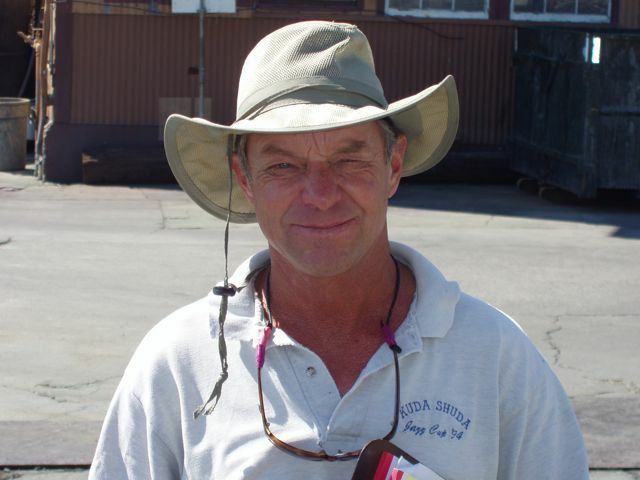 Bill is the real deal, having worked for many years in a boat yard. He's also a good guy and worked hard to provide us with a useful and valid survey. He also worked to deliver it to us in as short a time as possible so that we could acquire our cruiser's insurance. Thanks, Bill. Wings as we left her Wednesday afternoon. 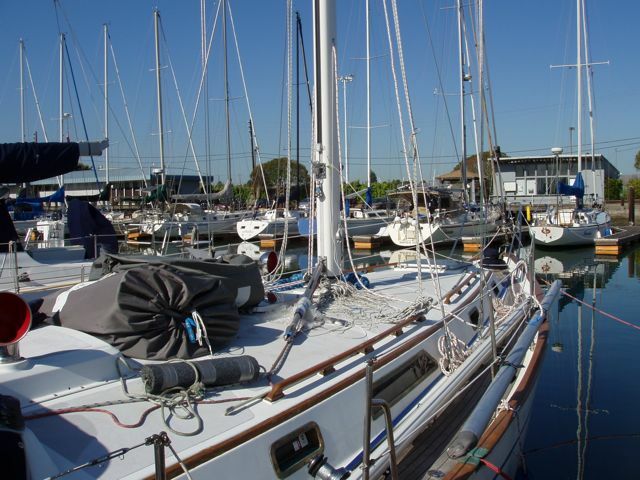 Her boom and main are on and all her halyards are ready to use. 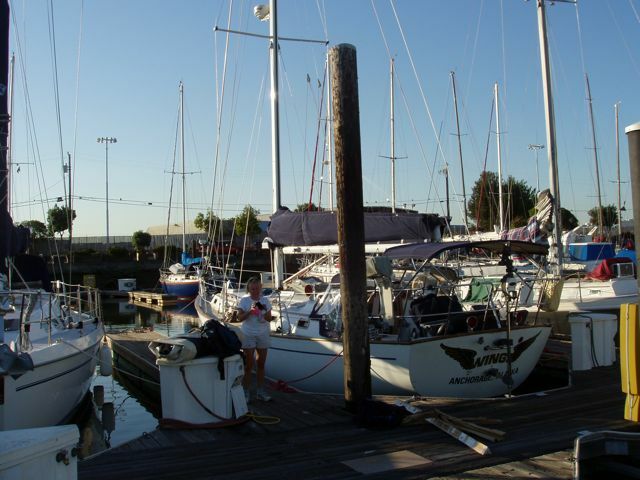 She's a sailboat again!